Ken Haddock will perform on Friday 27th January (8pm, doors 7.30pm) at the first of new regular monthly Friday night gigs at the EastSide Visitor Centre. Ken will play a selection of his own songs and favourite covers, which, in this intimate venue, will be very special indeed. Two excellent, emerging young EastSide performers will warm up for Ken, and you can say you heard them here first! East Belfast Community Development Agency (EBCDA) appoints the Community Representatives to the Board of EastSide Partnership and these places are now due for renewal. There are eight places for community representatives on the Partnership Board in addition to Independent Reps, Political reps and Statutory Reps.
Come join us in C.S. Lewis Square on Friday 20th for an hour of fun and fitness with Fitness Freddy, 11am-12pm. All you need is a pair of trainers and a good sense of humour! We'll do the rest! A 12-week art project, delivered by EastSide Arts and supported by Arts Council of Northern Ireland, aimed at breaking down isolation, loneliness and promoting well-being amongst older residents of east Belfast, is starting this week. Taking place at the EastSide Visitor Centre, the free drop-in workshops include craft, creative writing, interactive music workshops and printmaking. Come along and make your mark on the new artwork for the EastSide Visitor Centre. Join artist Dee Craig on Thursday 19th January, 2-4pm for this final paint session. East Belfast Urban Village Gardeners invite you to join them on a visit of Wildflower Alley in South Belfast. The Holylands alley has been transformed with plant boxes and containes with wildflowers and herbs now lining it. Join EastSide Arts for an evening of Eastern European food and local entertainment with a screening of Causeway Pictures Time & Again and a special performance from the EastSide Choir! 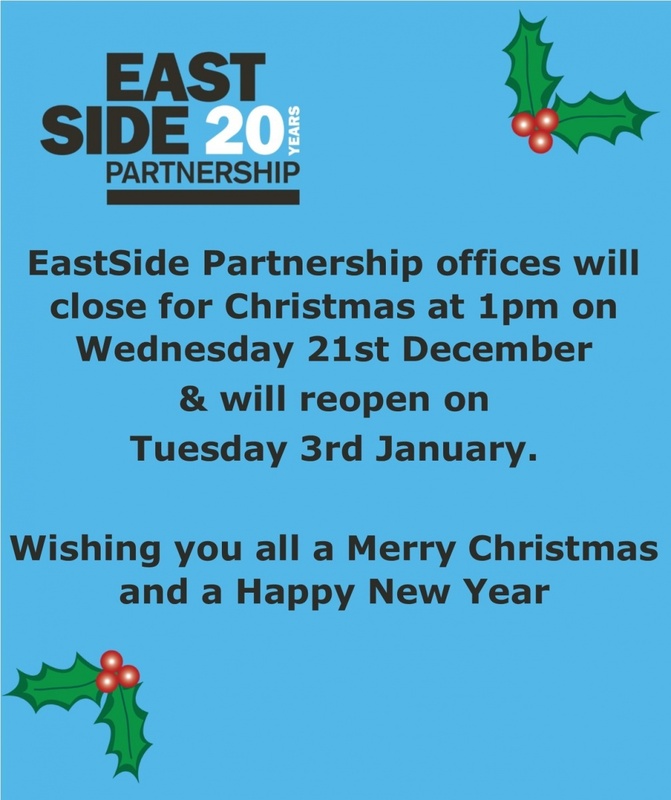 On Friday 9th December we held a dinner in Park Avenue Hotel to celebrate 20 Years of EastSide Partnership. The dinner was an opportunity to celebrate this milestone year and to thank everyone who has been with us on our journey to date. Staff and board members past and present came together with our elected representatives, funders, sponsors, community and business partners to celebrate the work and successes of the past 20 Years. Whether you want to bring your children to see Santa, stock up on treats for the family or fill stockings with gifts handcrafted in East Belfast, the first Urban Villages funded Christmas Craft Fair on Saturday 10 December has it all under one roof. The Christmas Craft Fair at Skainos, is bringing together groups from across the community who have worked lovingly and tirelessly to produce unique Christmas decorations, tableware, toys and accessories, including hats and scarves, and art for you to buy and enjoy this festive season.